Will an ER Doctor Find Your Client’s Advance Directive? No. Not in the vast majority of cases, at any rate. This is the troubling conclusion in 2 recent studies. Both were in Emergency Departments, both using electronic health records (EHR). Only 13% of all patients had an advance care planning document that the ER could find in the electronic record, although 59% said they had completed one. Furthermore, the patients in this study were exactly the seniors for whom it’s most important to have their advance directive: they were over 80 years old or else over 65 with some risk of short-term mortality. Strike one for assuming the Emergency Department will have your clients’ advance directives when they need them. So maybe part of the problem is that patients never actually gave their advance directive to the hospital? Could be. In fact, only 12.5% of patients said they had given these documents to the hospital previously. 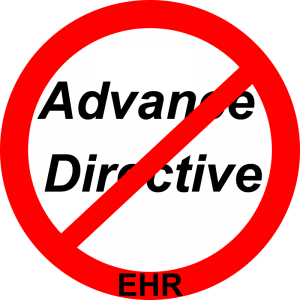 But even when patients reported that they had already given their advance directive to the hospital, their documents could not be found in the EHR in almost 70% of cases (69% to be exact). This is an abysmal record. Strike two. For almost 80% of patients whose primary doctor was part of the same hospital system as the Emergency Department, no ACP document could be found in their records. Strike three. Fewer than 1/3 of emergency room doctors felt “very confident” or “extremely confident” that they could find patients’ advance directive or other ACP documentation in the current EHR — when it exists! These doctors also talked about the problems they face in trying to find an advance directive within the EHR. I reviewed many of these problems in my May 2016 blog post. Clearly, relying on the doctor’s office, the hospital, or the Emergency Department’s medical records, even electronic ones, is not the current sole answer to making clients’ advance directives accessible. Especially in an emergency. And it won’t be the sole answer for a very long while. Other methods are necessary to ensure that your clients’ health care wishes can be known and followed.